BIBI’S BLOW OUT: Netanyahu miraculously surges to 29 seats. Has 5-seat lead over Herzog. Obama campaign against Bibi backfires. (Central Israel) — The Israeli media was completely wrong. The newspaper polls were completely wrong. The exit polls were completely wrong. The Obama team efforts to unseat an American ally were a complete failure. Netanyahu wasn’t losing. He wasn’t about to be shipped off to retirement in disgrace. This wasn’t close — this was a landslide. A “crushing victory,” says the Times of Israel. A “sweeping victory,” says the Jerusalem Post. A “shock election victory,” says Ynet News. 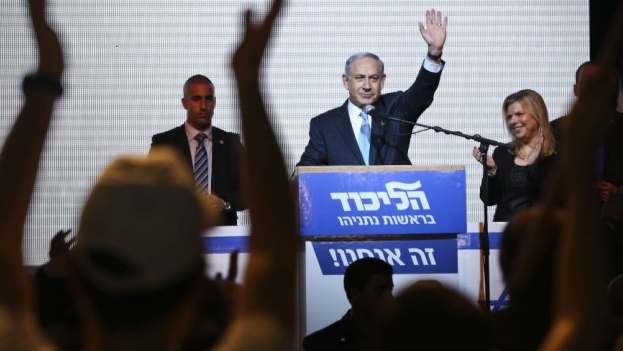 “Benjamin Netanyahu’s Lkud party is set to emerge as the election’s big winner,” says Haaretz. It’s now 5:30am. The sun will soon be rising here, and as it does Israelis — and the world — will be awakening to a miracle. ← Obama ’embarrassed’ for senators who sent letter to Iran, but not for this?